WaterSaw teams up again with the elegant choreography of Sonsheree Giles and Megan Lowe. The show will be on Saturday, March 10, 2018, at The Red Poppy Arthouse in SF 2698 Folsom St. More details on Saturday showtimes and content soon! Performances: JUNE 16th to July 2nd 2017 Friday, Saturday and Sunday @ 8:30pm 2050 47th Ave San Francisco (btw Pacheco and Quintara) TICKETS are LIMITED! Click here to buy tickets. 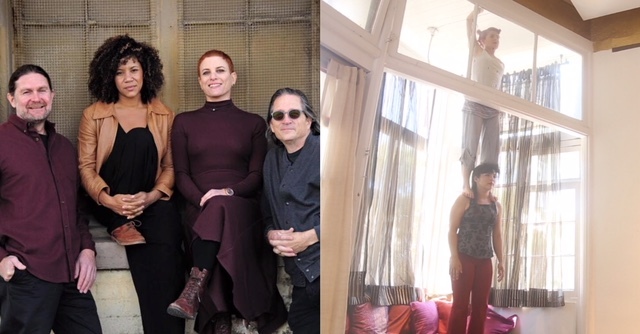 KALW 91.7FM Live Interview Lizz Roman (choreographer), Chris Black (dancer), and Nicole Laby (WaterSaw vocalist) talk about the show and debut one of our music compositions. East Bay Express visited Lizz Roman & Dancers in August during a rehearsal; they captured some live rehearsal footage, with one section highlighting Nicole and Mark (sorry, Mike and Chris!). See the full East Bay Express article and video here. Waterwaw is teaming up with Lizz Roman & Dancers again. This weekend it’s the annual Trolley Dances in San Francisco. More information is available here. We will perform throughout the weekend at 55 Fillmore Street. On Monday night 3/25/13, we were very excited to receive an Izzie Award for Outstanding Achievement in Music/Sound/Text for our work with Liz Roman & Dancers last summer. What a terrific experience.